We meet on the First and Third Monday. Waterford Rotary is part of an International Organization. Waterford Rotary was founded in 1973. The two Rotary mottoes are: 1. Service Above Self 2. He Profits Most Who Serves Best. Rotary is thoughtfulness and helpfulness to others. May is Education month for Waterford Rotary. We recognize one student from each elementary school, as well as one from each team at the Middle School and each grade at the High School and one from Waterford Country School. In the spirit of Rotary – The Students of the Year criteria – is a person who demonstrates Leadership qualities as well as community service. Students of the Year – receive a certificate thanking them for portraying the Rotary Ideals. The 2016 Waterford Rotary Students of the Year are: Fifth Grade: Peter Colonis, Jordon Dunkerley, Hannah Ard. Sixth Grade: Natalie Huhn, Madison Gates, Esther Kiefer. Seventh Grade: Logan Avin, Abigail Saucier, Sophie Marcille. Eighth Grade: Davin Ingves, Anthony Sachatello, Zoe LaBonte. Ninth Grade: Sophia Amodeo. Tenth Grade: Olivia Pitasi. Eleventh Grade: Megan Sturm. Twelfth Grade: Kazi Walker. The Waterford Rotary Club recently held an Installation Dinner to install their new President, Board and Officers. 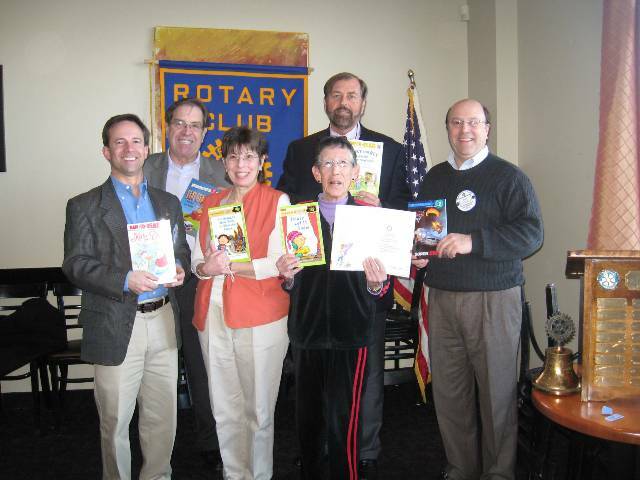 The Waterford Rotary Club is part of an International Organization. Waterford Rotary was founded in 1973. The Rotary motto is Service Above Self. Rotary is thoughtfulness and helpfulness to others. For a small club of about 35 members – we are very busy and we do good things in our community and in the International communities as well! The Waterford’s Alcohol and Drug Education (W.A.D.E) Coalition which was formed in 1996 in response to parental concerns about underage substance use received a federal Drug Free Communities grant in 2008. With the ultimate goal of combating underage substance abuse, the W.A.D.E. Coalition designated the funds to promote a drug-free community. One of their immediate concerns was the area around the gazebo and skateboard park. Parents and police had expressed concerns about drug activity and they strongly believed that repairing the gazebo and thinning out the tree line, near the skate park, would promote a healthier environment with more positive opportunities. With careful planning and consideration, the coalition worked with Recreation and Parks, Public Works, and Planning to repair the gazebo and make other environmental changes to the Civic Triangle and the skateboard park. By using environmental strategies, such as media campaigns and physical design changes, the W.A.D.E Coalition continues to have overwhelming success in altering community norms around underage substance use in Waterford. The Waterford Rotary Club recently honored three of their members. Paul Harris was the founder and organizer of the first Rotary Club in Chicago in 1905. He was the first President of Rotary International. A Paul Harris Fellowship is one of the Rotary organization's highest honors. It is accomplished in two ways: a donor contributes $1000. to the Rotary Foundation OR the club may recognize one of its own by a donation of $1000. to the Rotary Foundation. Recently the Waterford Rotary Club honored Jerry Swope and Rita Provatas for their own contributions to the Rotary Foundation. The Rotary motto is "Service Above Self" which is similar to the Fire philosophy of serving others. What has Waterford Rotary Done? Waterford Rotary may be a small club but we do big things in the Waterford community and the International community as well. 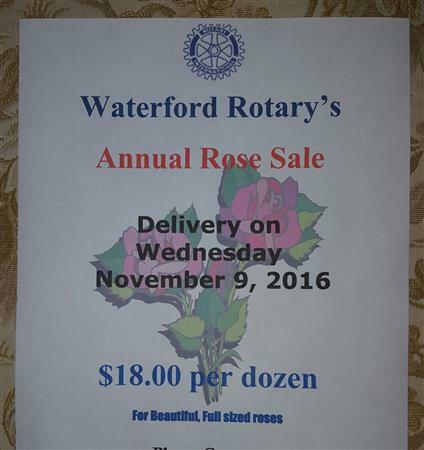 The Waterford Rotary Club dates our roots back to 1973. We are a small club of 30 members and meet every Monday at 12:15 at Filomena's restaurant where we enjoy lunch, good company and an interesting speaker as well as discussion on our service projects. If you would like to learn more about joining our club, please email me at rcurrier@coreplus.org. I'd be happy to get to know you.